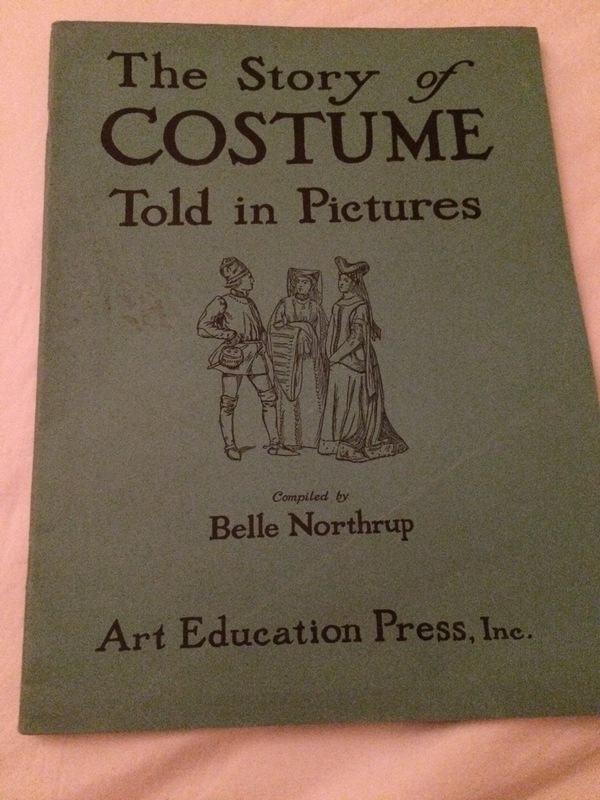 This post concludes my series on Belle Northrup’s article. The other two posts can be found here. One thing I would like to mention is that I have included all of the information and examples in Northrup’s article in these posts. There are no examples left out. With that out of the way, let’s move on to what Northrup did talk about. 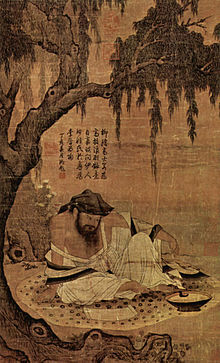 Northrup’s reason for talking about yin and yang in nature, architecture, art, and music is “to set up a clear and meaningful personality scale so that we may learn more easily to appraise ourselves and others.” We are to set up a personality scale with yin gentleness at one end, and yang strength on the other. The women she uses for her examples of yin are Janet Gaynor, Joan Bennett, Lillian Gish, Mary Pickford, Helen Chandler, and Anne Morrow Lindbergh. 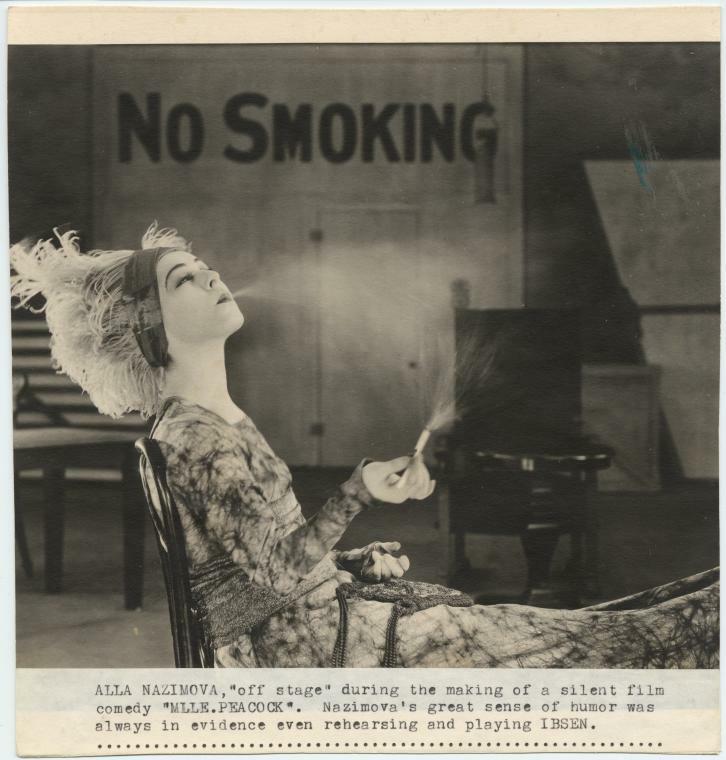 The women she uses for her examples of yang are Greta Garbo, Alla Nazimova, Katharine Cornell, Helen Wills Moody, Kay Francis, and Jane Addams. From the theater, we have the characters of Electra, Cleopatra, and Lady Macbeth (no mention of whether they are yin or yang; I am going to guess that Electra is yin and Cleopatra and Lady Macbeth are yang, but I welcome other ideas in the comments); yin Mignon and Mimi; and Yang Aida and Brunhilde. Northrup says we can also associate yin and yang women with flowers, trees, or buildings. Some yin women are birch trees, trim and delicate. Some yin children are gentle and flowerlike, and thus reminiscent of sweet peas or Queen Anne’s lace. In contrast, there are yang girls and women who remind us of the pine and the oak, and calla lilies rather than lily of the valley. They are the march and not the minuet; they are the cathedral and not the cottage. Janet Gaynor and Greta Garbo are the two Northrup uses to epitomize the opposition of extreme yin and extreme yang. Some individuals on the list earlier may be less yin or yang, but extremes nonetheless. She says that this suggests that we can use this scale as a gauge, from Gaynor to Garbo. Yin qualities are gentleness, delicacy, demureness, lightness, grace, piquancy, naiveté, and youth. Yang qualities are strength, force, dignity, power, serenity, vigor, sophistication, and maturity. Northrup adds that both yin and yang traits will always be seen as positives for these purposes. Yin is not weakness, frailty, and subjection, but instead gentleness, mildness, and delicacy. Yang is not aggressiveness, crudeness, or overbearing mannishness, but instead strength, poise, and dignity. Extremely yang people are tall, dark, and strongly built. Their voices are deep, their features are forceful and well molded but not small, and their eyes are direct. Extremely yin people are short, light, and fair, with small features and soft voices. There is an ease and a lightness in their body movements. By establishing these opposites of what Northrup calls “personality-expression,” we can set up a scale to be used to interpret and understand not only extremes like Garbo and Gaynor, but the larger majority of people who fall somewhere along this scale. …each of her individual traits depends upon the others and forms the sum total of her personality. 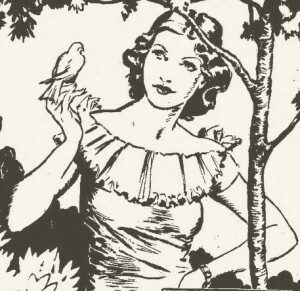 We will not then rate this person as a “type” because she has blonde hair or is tall and willowy–partial and inadequate judgements–but we will form a picture of her in her completeness. No one part will be overemphasized, and a fairer, broader basis for dress selection will be established. Northrup says that during this process, you will often find hidden, attractive qualities in both personality and appearance in a person that you will want to emphasize. Using yin and yang, we can get an insight into someone’s “essential and interesting” personality. Once we have learned to appraise and “see” an individual or ourselves, the answers to problems of dress become clear. Once you know what you are aiming for, what you want to express in a person’s appearance, selecting or designing clothes becomes even more interesting and significant. That is how she ends the paper, and unfortunately, it seems to be where our access to her theory and methods ends as well. This paper was supposed to be a chapter of a longer book, which I assume would have gone into depth about both how to evaluate a person’s personality-appearance, and how to design for it. From what I can find, this book never materialized. This article has Northrup telling us what 1939 fashions would be suitable for yin and yang types. I hope that you have found these interesting and helpful. If you have any information or sources that I haven’t covered here, please let me know. Last post, I talked about how she saw yin and yang generally, and the examples she gave of yin and yang in nature. This time, I will share her examples of yin and yang in architecture, art, period dress, and music. Early Doric temples, the “massive columns of the Great Hall at Karnak in Egypt,” the masonry arches of Romanesque or Norman buildings, and the “white-pillared Georgian mansions of the [US] South” are all yang. Grain elevators of the prairies and modern industrial buildings lacking ornamentation are also yang. 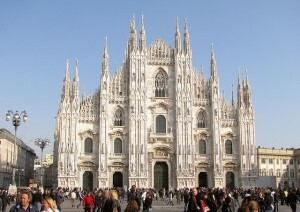 Gothic cathedrals combine both yin and yang. 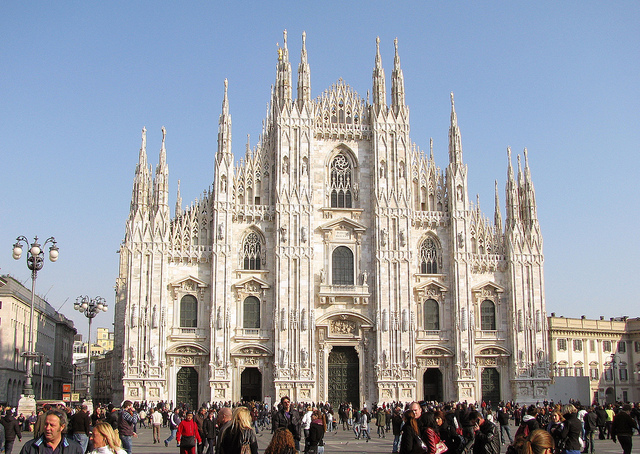 Their “towering structure and vaulted heights” represent their yang, and their “slender pinnacles and lacelike carving” are yin. In art, Botticelli’s fragile figures, da Vinci’s subtle and tender faces, and Marie Laurencin’s pale, child-like women are all yin. The use of color gives a general impression of gentleness and delicacy. Tintoretto, Rubens, Hals, and many modern artists use pigment in a very yang way. Painting in the Sung period blended yin with yang. In early Greek sculpture, we see them in contrast to one another. An Ancient Greek dancer in bas relief is yin. “Juno, Hera of Samoa” is yang. Stone as a medium is essentially yang. 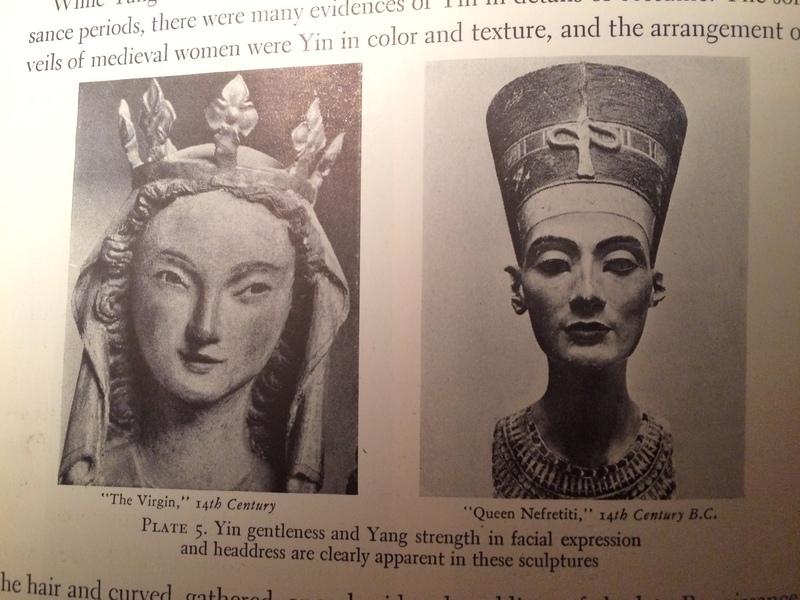 Egyptian queens and medieval women wore yang costumes, regal and dignified. The portals of Chartres have carved kings and queens of Judah in austere yang forms. Smaller carvings, such as this 14th-century “Virgin,” show this dignified costume in a yin way. 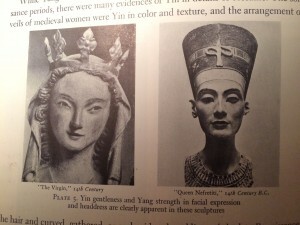 The statue of Nefertiti is dressed in a yang way. Puritan dress was yang. Loyalists dressed in a yin way akin to the fashions in England and France. In music, Debussy’s delicate strangeness is yin (listen) and the mighty sweep of a Beethoven movement is yang (listen). Chopin, Grieg, and MacDowell are yin, and Bach, Brahms, and Wagner are yang. Graceful yachts are yin. Sturdy tugboats are yang. The Sheraton settee is yin, while the low-slung sofas of Northrup’s period are yang. Next, I will cover yin and yang in women, featuring 1930s celebrity examples. This is the only relevant publication, besides the book I reviewed, that I have found that was written by Northrup herself. (I also found an article on teaching sewing and costume design in high schools, but I will not be reviewing or summarizing that for obvious reasons.) It says that it is a chapter of a longer book that she was working on, but unfortunately, I haven’t been able to find any evidence that this book was ever published. It seems that this article is the only work we have by her that describes her approach to yin and yang. In this article, Northrup introduces the ideas that are key to our current understanding of style identity and harmony. She begins with a fundamental question: “Who shall wear what?” She says that dress and personality bring together the costume (outfit) and the person wearing it. Emotional and physical traits are sensed as a whole. All aspects of personality and all aspects of appearance must be taken into account. We must consider what the clothes do to the individual wearing them. Understanding the answers to these questions requires new terms to explain the complex meanings that we have only been able to “feel” previously. Northrup used “yin” and “yang” because she saw no terms in English that described this fundamental opposition, found in everything around us, as succinctly as “yin” and “yang” do. In Chinese philosophy, yin and yang set up a scale of universal opposites. Yin came to mean quiescence, absorption, and gentleness, and yang strength, penetration, and vigor. Northrup gives many examples from nature, the animal kingdom, art, architecture, and music to illustrate her point. YIN is tenderness: darkness and the moon, the yielding nature of water, the softness of moss, and the exquisiteness of frost traces in winter. YANG is force: the sun and the light of heaven, the weightiness of granite, the rigidity of metal, and the potency of flame. We can see this opposition in everything around us. A silver birch tree, a graceful willow tree, lilies of the valley, and field daisies are yin plants. 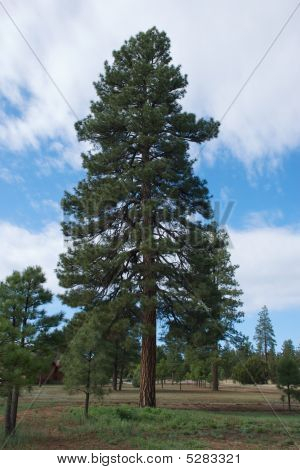 A gnarled oak, a towering pine, calla lilies, and sunflowers are yang. Yin animals include deer, race horse, fox terriers, pekingeses, and panthers. Yang animals include elephants, oxen, great danes, shepherd dogs, and lions. In my next post, I will cover yin and yang in architecture, music, and art. Quick note: I am going to be computer-less until the last week of January, so I am going to be blogging from my phone. Please excuse image quality, etc. I bought this book from Amazon without any clue as to what it actually was. It wasn’t expensive, and I want to start collecting historical books related to style and color. The only original source by Northrup I’ve been able to get my hands on is a newspaper article, so I jumped at this one. Unfortunately, it only has a short foreword, and the rest is just pictures of the way people dressed in different time periods. So it won’t bring any new details about Northrup’s method to life, and is more of a historical artifact. While I haven’t been able to access Belle Northrup’s 1936 article “An Approach to the Problem of Costume and Personality,” I did find, via Seasonal Color, an article in the Laredo Times from 1934 entitled “Are You Yin, Madam, Or Are You Yang?” (available here) that gives a short introduction to Northrup’s philosophies. Rather than the familiar Romantic, Dramatic, etc. categories we’re used to, Northrup uses animals. Northrup goes on to explain that you can also be a Horse Woman (good and strong), an Elephant Woman (strong, staunch, and wise), a Pony Woman (jaunty and jocose), and so on. 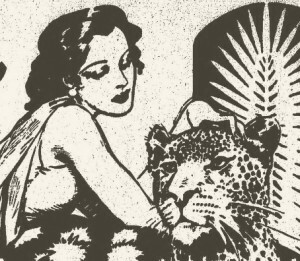 The author of the article suggests matching up your favorite actress to a zoo animal. 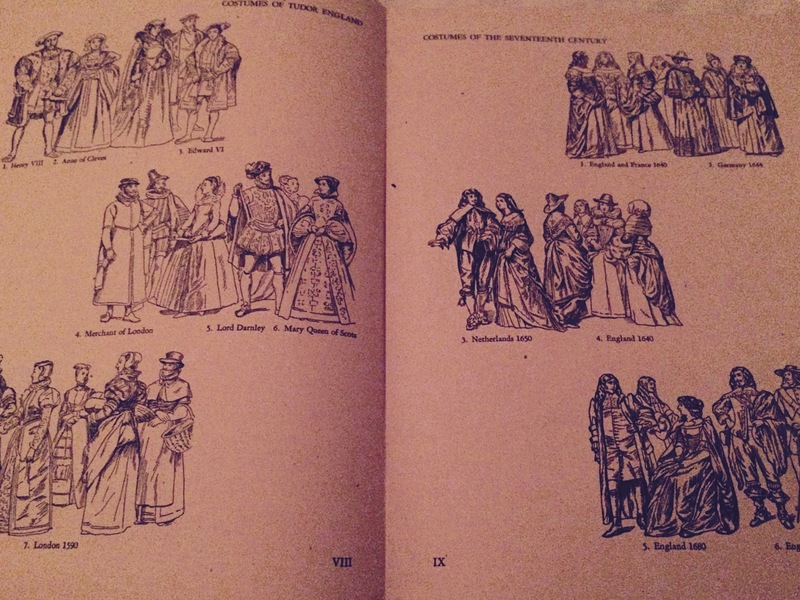 Northrup’s ideas would be developed further by Harriet Tilden McJimsey in Art in Clothing Selection in 1963, which will be the subject of my next post. All of the style systems that rely on using a woman’s essence to define her style have their roots in Ms. Northrup’s work. Alla Nazimova photograph from here. 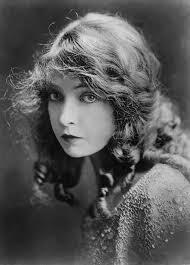 Lillian Gish photograph from here. All other information, quotes and pictures from here.